For some reason it took me a while to get to this one. My wife and I read every Stephen King book, and we generally get them and read them within a year or so of publication; this is one author we are willing to pay full hardcover price for. Maybe that’s the reason, actually: maybe Duma Key sat on the shelf for so long because it’s not a hardcover; we bought it in mass market paperback, and what’s more, we bought one of those tall paperbacks – the “Summer beach read” edition, I’ve seen them labeled. And in terms of book format, I didn’t like it. It just seemed wrong. Off, somehow. Which, actually, is probably entirely appropriate. Well, now I’ve read it, and: it’s not one of my favorites. It’s got some great elements to it. I loved that the main character, Edgar Freemantle, is an artist. I love when King is able to describe what it’s like to make art, to feel the need to make art, and especially the down side of it: the emptiness and exhaustion that come after working on art, the constant self-doubt and that nagging belief that these people only like your work because they like you. I also liked the scenery: set in the Florida Keys, in a salmon-colored beach house that the hero calls Big Pink, there are wonderful descriptions of the Gulf, of walks on the beach, of overgrown greenery, of grand old Florida houses. 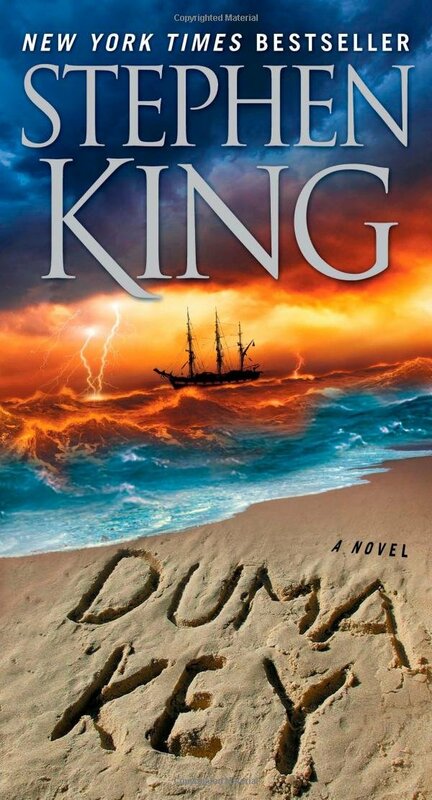 I liked the characters, for the most part, especially the key characters of Elizabeth and Wireman and Jack, the people that help Freemantle discover the solution to the mystery of Duma Key. But I didn’t like the way the novel went bad. Now, all of King’s books go bad: the man writes horror, after all, and even when he’s not, he tends to put his characters in horrible situations. I’ve read The Dark Tower (No way that movie’s going to work, by the way. Not because of the casting, but because the beauty of The Dark Tower is the world that King built, this amazing world that has moved on. And it took King seven novels, ranging from 300 to 1000 pages each, to build that world. Make that into a movie, and it will be a month long. Which, actually, sounds pretty awesome, but I feel like those seats would get really uncomfortable after a while. And if you thought movie theater floors were sticky before . . .) and it’s definitely fantasy – but that is not a happy place, that world, and those are not happy lives those characters lead. So of course Duma Key would feature some terrible things. And like many of King’s books, this one starts off bad: because Edgar Freemantle was a builder, until he got crushed by a crane at one of his job sites. He suffered several crippling injuries, not least to his head, and his right arm was amputated above the elbow. The book starts with his recovery, and focuses on his troubles with speech and wild and violent mood swings while recovering from his traumatic brain injury. And like the other things that King has written since he himself got crushed by a car, this is vivid and detailed and very true to life. And then when Freemantle moves to Duma Key to continue his rehabilitation, it’s great: the Key is wonderfully depicted, and that’s where we meet all of the other good characters, and encounter the mystery, which is pretty cool. And then the majority of the book is Freemantle’s life as an artist on a Florida Key, and I liked it. But then the horror comes in. And I feel like King got caught up in his own story as an artist in the Keys, whether he went there to write the book or only imagined them; because it’s almost like he forgot he was writing a horror novel. There is a sudden appearance of a horrible apparition, and it’s bad, but there doesn’t seem any reason for it. And then Freemantle is afraid of his mystical painting gifts (Those gifts, a result of both his injuries and the magic of Duma Key, were well done: but the change from being fascinated by that magic to being scared by it was not. ), and I don’t see why. And then everything falls apart, as it often does at the end of King’s novels (and in life), but it all goes bad too quickly. It made me long for The Shining, or Insomnia: one of King’s books where the flow and the buildup of tension are just right, and you end up reading wide-eyed and dry-mouthed at three in the morning because you just can’t put it down. Duma Key didn’t do that. It was good, I liked the ending and its solution to the evil mystery, and I loved the time on the Keys; but this wasn’t my favorite of King’s novels.